It's CLEARANCE time! Swim + Resort Wear 30-70% Off! . : Sequins and Sand Resort Wear :. It's CLEARANCE time! 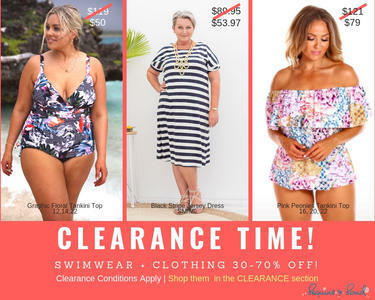 Swim + Resort Wear 30-70% Off! Hey girls! How are you? BIG NEWS! It's Clearance time here at S&S! A great time to grab an extra pair of togs for you or someone else. This year, our Clearance sale has a bit of a different back story. As many of you may have seen in our recent Facebook post, we are closing our little studio in Ashgrove, Brisbane. The building has been sold. It's going to be gutted and refurbished and their future plans for it didn't work for us, so we are moving on. Not sure where to yet but what is for certain is that ONLINE we will still be powering on! So we thought we'd move as much stock as we can before we leave on the 6th April. Everything in studio is 30%-70% off AND we've added selected styles online in Clearance for you all to enjoy the bargains too! Thanks girls. Hop on over and grab your Clearance bargain! And if you are in Bris Vegas, find even more bargains in studio - 60 Frasers Rd, Ashgrove. We close the doors 3pm Saturday 6th April with a drink or two on the deck. Pop on in!